The most common hereditary colon cancer disorder, Lynch syndrome, increases the risk of colorectal cancer (CRC) and are usually caused by germline mutations in 1 of 4 mismatch repair (MMR) genes: MLH1, MSH2, MSH6 and PMS2. Identifying people who are at risk is important for their care, as well as the care of members of their family. A Lynch diagnosis may determine the extent of colon cancer surgery, for instance, and it increases the need for more-frequent colonoscopies after a colon cancer diagnosis. Douglas L. Riegert-Johnson, M.D., a medical geneticist and gastroenterologist at Mayo Clinic in Jacksonville, Fla., says about 2 out of every 100 screened patients test positive for Lynch syndrome and generally find other members in their family with colorectal cancer, or other Lynch-associated cancer. Dr. Riegert-Johnson notes that a few other centers are using multi-gene panels for hereditary colon cancer but in general, far too little Lynch syndrome screening takes place. 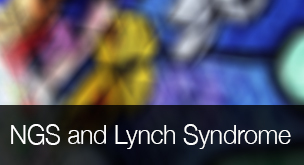 "As of today, 1 percent of hospitals — 57 of 5,724 — are listed as routinely screening for Lynch syndrome," he says. "Despite an important 2005 study supporting screening, it has been slow to catch on."